You are here: Home » MEDIA » Books » The Lost Fleet: Beyond The Frontier: Guardian by Jack Campbell (book review). 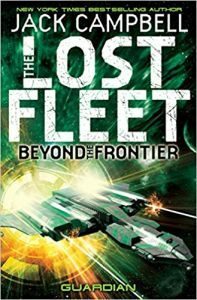 The Lost Fleet: Beyond The Frontier: Guardian by Jack Campbell (book review). Its been quite a while since I last reviewed a book from Jack Campbell’s ‘The Lost Fleet series. The original series comprises of six volumes charting the heroic ‘Jack Black’ and his exploits in trying to lead the remains of the Alliance fleet back to safety after being ambushed by the Syndicate World’s own fleet. One of the compelling reasons for reading ‘The Lost Fleet’ series was the author’s gift in depicting space battles. Campbell has a knack of depicting a space battle involving two fleets of spaceships. The tensions would mount as the two fleets approached and manoeuvred for position. Even though the speeds involved usually meant that a battle was a series of skirmishes which were brief but intense, the way it was told and engaged you would leave you drained. I’m glad to say Campbell’s not lost his touch. Guardian is the third book in the ‘Beyond The Frontier’ series of five books. So, it’s the middle book which as we will see has pros and cons. Proceeding ‘Guardian’ were ‘Dreadnought’ and ‘Invincible’. Following it are ‘Steadfast’ and ‘Leviathan’. It’s worth noting that the books don’t really work as standalone volumes. You do need to have read the proceeding books to know what’s going on. At the very beginning of ‘Beyond The Frontier’, Admiral Geary (Black Jack – you need to read ‘The Lost Fleet’ to understand this) is dispatched with a fleet to basically get him as far away from the Alliance as possible. The Alliance politicians have become weary and fearful of someone who the public and the military adores. Skipping over the first two volumes, we find that Admiral Geary has completed the goals of his mission in exploring beyond the frontier but now he’s got a rather long list of problems. In his exploration, he has discovered a new race which is 100% hostile and another race which may or may not be friendly. He’s also stuck at the Syndicate star system Midway. The locals have rebelled against their Syndicate World oppressors (hurray!) but the Syndic’s responded by dispatching a rather large naval fleet to the system (boo!). The Alliance fleet clearly has the superiority in numbers and manpower but is hampered by the fact that technically the Alliance and Syndicate Worlds have a cease fire. Geary can’t leave Midway as the Syndicate fleet will invade but he can’t drive them off neither because of the ceasefire. We have a standoff. Also complicating things is that Geary managed to capture an alien vessel and everyone would like to get their hands on it. There’s never a dull moment when Black Jack is around. Admiral Geary has to sort out the problem of Midway, protect his prize and get everyone safely back to Alliance territory. This leaves ample scope for some epic space battles, political manoeuvring and in-fighting along the way. It was never going to be an easy journey. In addition to the big space battles, there are also a number of small scale skirmishes which allows Campbell to show us what the Marines can do. While I really do like his space battles, I thought the Marine action was rather well done and offered something different. I’m being careful here not to give away any spoilers, but I can say Admiral Geary leads his forces from one location to another, fighting most of the way. The fighting is good and is what we have come to expect. What I didn’t expect was the ending to this, the third and middle book. It’s not really an ending at all with way too much left undecided. You have more loose threads than carpet as you end the book. That’s not to say it’s a bad read, as it’s actually rather good up until the ending. If the purpose of the ending was to get you to buy the fourth book in the series, then I think it’s scored top marks. I for one, want to find out what happens next. « Music From Jim Henson’s The Storyteller Featuring Original Score by Rachel Portman (music review).